You can have a set of different colors or patterns for clothing in space. To set your clothing item up to have different patterns, first choose a main clothing mesh which you wish to recolor. 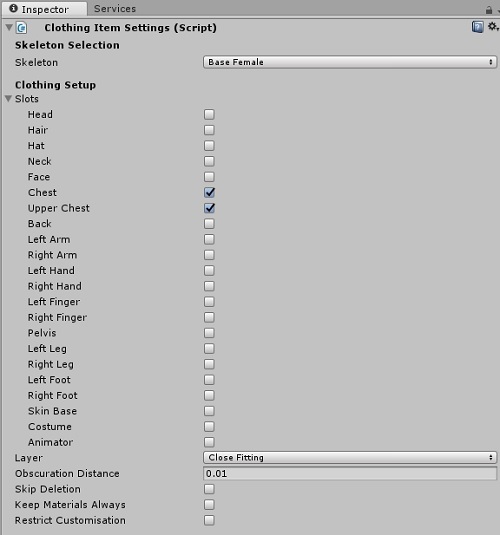 When you have chosen the clothing you want, you need to add the 'Clothing Item Settings' component. Do this by clicking on 'Add Component' in the Inspector window and search for clothing item settings. Once this is done, you can then select all the slots needed for your item. I am using a vest top, so I have selected the chest and upper chest slots. Remember, if you want other items to be used with your clothing, don't select the slots for these items, such as back for wings, wrists/arms for bracelet e.t.c. Make sure you leave 'keep material always' unchecked for making extra patterns as you just want the base mesh to upload. follow Importing and Uploading Clothing from 'Steps of Uploading' to upload your clothing item to space. When it has finished processing and it's in space, make a note of the curator ID in Unity for your clothing item. You can find the curator ID at the bottom of the virtual good component, or you can click on 'Space' at the top of Unity and choose 'Items and Status' to see the ID. To create the extra patterns, you need to first create an empty game object in your scene by right clicking in the hierarchy and choosing 'Create Empty'. You can rename this to the clothing item and color you are going to use. For example, if you have a dress and you want one of the patterns to be a plain blue, you can rename the empty object as 'Dress - Blue'. This will help you differentiate between other patterns of the same clothing item. Note You will need to use the UV map of the clothing item to make color variations in Photoshop or similar software for the patterns. 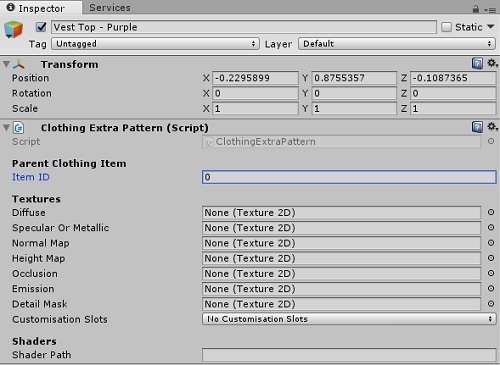 Make sure your empty game object is selected and in the Inspector window, click on 'Add Component' and search for 'Clothing extra pattern'. This will bring up the component in the Inspector window. This is where you put the Item ID of the clothing item, for example as shown above, mine is 2107941, so put the ID number generated for your item here. Diffuse - This is where you will but the diffuse map for your clothing. This contains the color you want to use. Specular or metallic - This is for a specular or metallic map. Normal Map - This is where to put the normal map/bump map. Height Map - This is for a height map. Occlusion - This is for an Occlusion map. Emission - This will be for the emission map. Detail Mask - This is for the detail mask map. Customisations Slots - This is for choosing to make the item customisable with the choice of no slots or three slots. You will need to drag diffuse map into the diffuse box, and then repeat the step for any other maps you are using. Click on 'Add Component' under the extra pattern component in the Inspector window and search for 'virtual good' and add this to your empty object. Once this is done you can add in the details for this pattern. For example, I named my item Vest top - Blue, and then filled in all the other details. Drag the item from the hierarchy into the project window to make it a prefab before clicking on auto submit. Don't add any ID to this item, as it will be generated when you auto submit this item to space. You can duplicate the prefab to make it easier for you to make multiple recolors; Just right click on the recolor in the heirarchy and choose duplicate. Remember to rename the copies to the color they will be to avoid confusion, and also remember to drag these new recolors into your project window to make a prefab before uploading to space. You can watch Clothing Patterns for a visual guide to these steps.